[S641] Anderson Brandon and Reed, "Mansfields of the Massachusetts Bay." [S642] Jean E. Perreault, Simsbury 1930 Census, page 166. Anna Marie Bushkovski was born on 25 December 1911 at Whitewater, Butler Co., KS.1 She married Lowell Preston Kelly, son of George Edward Kelly and Helen Adams, on 26 August 1944 at Cincinnati, Hamilton Co., OH. Anna Marie Bushkovski died on 20 March 1992 at Cincinnati, Hamilton Co., OH, at age 80.1 She was buried at Oakdale Cemetery, Dillsboro, Dearborn Co., IN. [S182] Social Security Death Index (on-line), Ancestry.com, SSDI, Ancestry.com, SSAN 511-20-6479. [S642] Jean E. Perreault, Simsbury 1930 Census, page 167. Ruth Bissell married Philip E. Mosely, son of Arthur Chauncey Mosely and Eliza Rust, on 3 April 1939. Philip E. Mosely was born on 21 September 1905 at Westfield, Hampden Co., MA. He was the son of Arthur Chauncey Mosely and Eliza Rust. Philip E. Mosely married Ruth Bissell on 3 April 1939. Philip E. Mosely died on 13 January 1972 at New York City, NY, at age 66. Dr. Philip E. Mosely, who was responsible for the planning of post-World War II settlements and who was one of the country’s leading experts in the Soviet Union, died Thursday at his home in New York City. A founder and former director of the Russian Institute at Columbia University, Dr. Mosely spend most of his career as an academician, frequently doing historical, political and social research in Russia. At the time of his death, he was director of the European Institute at Columbia, Adlai Stevenson professor of International relations at Columbia and associate dean of the faculty of International affairs in charge of research. After receiving undergraduate and doctoral degrees from Harvard, Dr. Mosely did research in Moscow and in the Balkans and taught at Union College and Princeton and Cornell universities before starting his service with the State Department in 1942. He served as an adviser to Secretary of State Cordell Hull at the Moscow Conference in 1943 and as a member of the U.S. delegation to the European Advisory Commission in London and the Potsdam Conference in the next two years. As an adviser to Secretary of State James F. Byrnes, he took part in the Council of foreign Ministers meetings in London and in Paris in 1945 and 1946 and was also the U.S. representative on the commission for the investigation of the Yugoslav-Balkan boundary in 1946. That same year he founded the Russian Institute at Columbia and was a professor of international relations there, serving as the institute director from 1951 to 1955. He left to become director of studies fo the Council on foreign Relations in New York. He returned to Columbia in 1963. For nearly two years, starting in 1968, Dr. Mosely was chairman of the research council at the Georgetown University Center for Strategic and International Studies. Dr. Mosely received honorary doctorates from the University of Notre Dame, Union college and Middlebury College. He was a trustee of the Rand Corp., and of the Foreign Policy Association and a member of the foreign affairs committee of the Chamber of Commerce of the U.S. and of the Social Science Advisory Board of the U.S. arms Control and Disarmament Agency. He is survived by his wife, Ruth; two daughters, Mrs. John Lesch, of Princeton, and Mrs. Philip T. Jackson, of Oberlin, Ohio; a brother, a sister and a grandchild. [S182] Social Security Death Index (on-line), Ancestry.com, SSDI, Ancestry.com, SSAN 041-22-7980. When William filled out an application for a social security card on 10 July 1941, he was 16 and working at the Canton Spring Co., in Canton. He listed his birth in Simsbury on February 19, 1925 and his parents "Harld" and Helen Maria Passaur Holcombe, with "Helen" struck through. [S642] Jean E. Perreault, Simsbury 1930 Census, page 274. [S182] Social Security Death Index (on-line), Ancestry.com, SSDI, Ancestry.com, SSAN 047-12-8318. [S182] Social Security Death Index (on-line), Ancestry.com, SSDI, Ancestry.com, SS-5 047-12-8318. Frances Ada Clark was the daughter of Dr. Asaph M. Clark and Rebecca Mason Nichols. Frances Ada Clark married John A. Green. 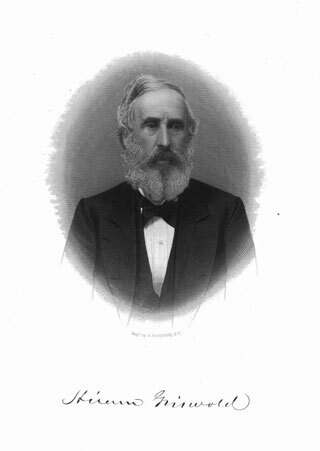 Hiram Griswold was born on 5 July 1807 at Colebrook, Litchfield Co., CT.1 He was the son of Roswell Griswold and Lucretia Wheadon.1 Hiram Griswold married Eleanor Gordon in 1832. Hiram Griswold married Mary J. Chisholm circa 1878. Hiram Griswold died on 11 October 1881 at Leavenworth, Leavenworth Co., KS, at age 74. Hiram was a laywer who lived in Cleveland and Canton, Stark, Ohio then Leavenworth, Leavenworth, Kansas. He served in the Ohio Senate. 2 He was the defense attorney for John Brown the abolitionist, having been asked to volunteer for the task by Judge Daniel R. Tilden of Cleveland. Hiram and Ellen were enumerated in the 1850 Canton, Stark Co., OH, federal census. He was a lawyer, age 42, she was 42. Children in the household were Margaritta 20, and Hellen Nicholson 14. Hiram and Eleanor were enumerated in the 1860 Newburgh Heights, Cuyahoga Co., OH, federal census. He was a lawyer, age 53, she was 50. There were no children in the household. Hiram and Elenor were enumerated in the 1870 Leavenworth, Leavenworth Co., KS, federal census. He was a lawyer, age 63, she was 60. There were no children in the household. Hiram and Mary were enumerated in the 1880 Leavenworth, Leavenworth Co., KS, federal census. He was a lawyer, age 73, she was 44. There were no children in the household. [S377] Coralee Griswold Griswold 6 & 7 Vol 1, page 55. [S377] Coralee Griswold Griswold 6 & 7 Vol 1. David Thomas was born in 1784 at Simsbury, Hartford Co., CT. He married Mary Holcombe, daughter of Lt. Benjah Philo Holcombe and Mary Case, in 1807 at Simsbury, Hartford Co., CT.1 David Thomas died on 17 August 1826 at Delaware Co., OH. He was buried at Thomas Graveyard, Liberty Twp., Delaware Co., OH. David Thomas, was a native of Connecticut and made a trip to this country to purchase land in 1801, and walked the entire distance, and with gun in hand killed game, upon which he subsisted ; on his arrival here, bought 100 acres on what was known as Col. Kilborne's section, and while here assisted in building the first mill that was erected in Franklin Co; he returned to Connecticut as he came-on foot. Shortly after married Mary Holcomb, now living and one of the oldest persons in this part of the county, she being in her 93d year, and resides with her daughter. After their marriage, he returned to this county in 1806 and built him a log cabin on the land he had purchased; Columbus and Delaware were then unknown ; hunting at that time was their principal pastime and by it they furnished subsisted ; on his arrival here, bought 100 acres on what was known as Col. Kilborne's section, and while here assisted in building the first mill that was erected in Franklin Co; he returned to Connecticut as he came-on foot. Shortly after married Mary Holcomb, now living and one of the oldest persons in this part of the county, she being in her 93d year, and resides with her daughter. After their marriage, he returned to this county in 1806 and built him a log cabin on the land he had purchased; Columbus and Delaware were then unknown ; hunting at that time was their principal pastime and by it they furnished their tables with quantities of the best of meat. [S418] Ruth Cost Duncan, John Case 2nd Edition, page 22. Lucas Thomas was born circa May 1808. He was the son of David Thomas and Mary Holcombe. Lucas Thomas died on 17 June 1851. He was buried at Thomas Graveyard, Liberty Twp., Delaware Co., OH. Sherman Thomas was born circa 1810. He was the son of David Thomas and Mary Holcombe. Sherman Thomas died on 28 March 1830. He was buried at Thomas Graveyard, Liberty Twp., Delaware Co., OH. Solomon Thomas was born circa December 1810. He was the son of David Thomas and Mary Holcombe. Solomon Thomas died on 11 December 1853. He was buried at Thomas Graveyard, Liberty Twp., Delaware Co., OH. Philo Thomas was born on 23 May 1820 at Liberty Twp., Delaware Co., OH. He was the son of David Thomas and Mary Holcombe. Philo Thomas married Ann Lowry on 10 April 1845. Mary A. Thomas was born circa 1847 at OH.1 She was the daughter of Philo Thomas and Ann Lowry. John Thomas was born circa 1815 at OH. He was the son of David Thomas and Mary Holcombe. John Thomas married Cordelia Holcombe circa 1850. John Thomas died on 14 June 1858. Jane Thomas was born circa 1824. She was the daughter of David Thomas and Mary Holcombe. Jane Thomas died on 13 September 1837. She was buried at Thomas Graveyard, Liberty Twp., Delaware Co., OH. Thomas Case married Lavina Thomas, daughter of John Thomas and Cordelia Holcombe.